Two Selective Dorsal Rhizotomy (SDR) procedures were performed for the first time at Schneider Children's in two children suffering from spasticity caused by a progressive genetic disease and as a result of cerebral palsy (CP). The operations were conducted by Dr. Kershenovich according to a technique developed by Dr. Park, a world-renowned surgeon from St. Louis Children's Hospital where the surgeon selectively destroys damaged nerve ends in the spinal cord through a very small cut at the level of the conus (the end of the spinal cord). Up until now, the technique required a long incision to remove the laminae at the back of the vertebrae. Dr. Kershenovich specialized in these procedures during his previous posting as Director of Neurosurgery at the Children's Hospital in Danville, PA, and he is among the first to perform the operation in Israel. "This technique requires one incision at one level instead of 5 vertebrae higher up," explains Dr. Kershenovich. "During the operation, we cut two thirds of 4 lumbar sensory nerves and from the first sacral sensory nerve on each side, totaling 10 nerves in all. By cutting the sensory portion of the nerve, we reduce spasticity. In fact, we remove the bad part of the nerve without any side-effects, and succeed in improving severe muscular distortion. Many Israelis have undergone these operations by Dr. Park in St. Louis, and the good news is that Israelis no longer have to fly to the US for these procedures. We do the exact same thing here at Schneider Children's." Almost simultaneously, three sophisticated neurosurgeries were performed by the Neurosurgery Unit to implant an Intrathecal Baclofen Pump in children suffering from spastic CP. During the operation, surgeons implant a pump that releases the drug baclofen which repairs muscles. Medication flows from the pump through a catheter implanted in the spinal cord into the fluid surrounding the spinal cord. In addition, improved spasticity can prevent muscle contractions and distortions, pain, bending, and discalculation of the pelvis which leads to disability. "The operation is performed through two incisions in the back and abdomen. The pump is implanted beneath the fascia of the abdominal muscle in a relatively simple procedure, and the patient is discharged the next day. The complicated part is not the operation per se, but rather all the processes surrounding it. 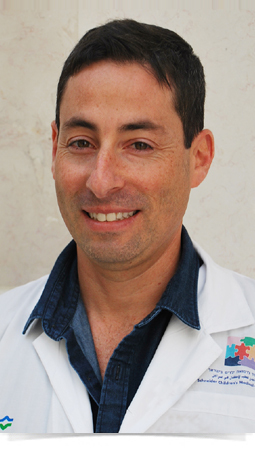 "These surgeries and the SDR procedure required the compilation of special teams comprised of Dr. Eilat Levy, a neurologist experienced in spasticity, and the neurosurgical team of a doctor, nurse coordinator and physical therapist who together assess the patient's suitability and conduct a trial epidural to check the patient's response to the medication", Dr. Kershenovich explained. "After the operation, the pump has to be refilled every six months, and we conduct follow-up of daily dosage adjustment according to the child's needs. The pump itself needs to be replaced in another operation after 7 years. The bottom line is that these operations represent a novel solution, relieving patients from the difficult conditions and great suffering associated with muscular spasticity."